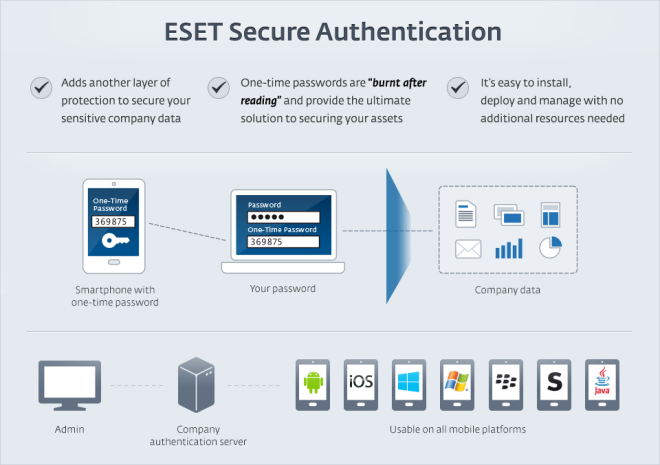 Why choose Two-Factor Authentication from ESET? ESET Secure Authentication delivers secure, yet hassle-free remote access to company network and data. A powerful mobile-based solution, it relies on two-factor, one time password (2FA OTP). The OTPs it uses are randomly generated, so they can’t be predicted or reused. ESET Secure Authentication natively supports Outlook Web Access/App (OWA) for Microsoft Exchange 2007, 2010 and 2013. It supports critical endpoints – Exchange Control Panel, 2010 and the Exchange Administration Centre, 2013. Use it with a broad range of VPN appliances and business tools, including Microsoft SharePoint, and Microsoft Dynamics CRM. Bolster the protection of your sensitive data accessed from outside the company – via a Remote Desktop Web Access login or VMware Horizon View. Easy integration with your RADIUS-based services or via an API to your existing Active Directory-based authentication. Non Active Directory customers with custom systems can use the easy to deploy SDK.